Make the last of orange season with this fresh salad! I had a few oranges that I needed to use up and I decided to try to make an orange vinaigrette for a salad. This recipe is very simple and healthy; it only took me about 20 minutes from start to finish and tasted delicious! Cooking the chicken breast in orange juice really made the meat flavorful and moist. The orange glazed chicken in this recipe could also be a meal on its own served with stir-fried vegetables and rice. Heat 1 teaspoon of olive oil in a pan on medium heat. Salt and pepper the chicken breasts and put them into the skillet. After you first flip over each piece of chicken, pour orange juice over the breasts. Allow the chicken to cook thoroughly as the orange juice begins to thicken (about 4 minutes on each side). Once chicken is done, put aside and let cool. Roast the almonds and sesame seeds under the broiler for about 2 minutes or until they begin to brown. Watch carefully, this can happen quickly! Put aside to cool. To assemble the dressing, combine olive oil, orange juice, balsamic vinegar, soy sauce, and mustard. Whisk together ingredients and then add the garlic. Put aside. For the garnish, segment the orange and finely chop the cilantro. Put aside. Slice the chicken breasts. Then toss the lettuce with the toasted almonds and sesame seeds, orange segments, and most of the dressing, reserving some for the top. 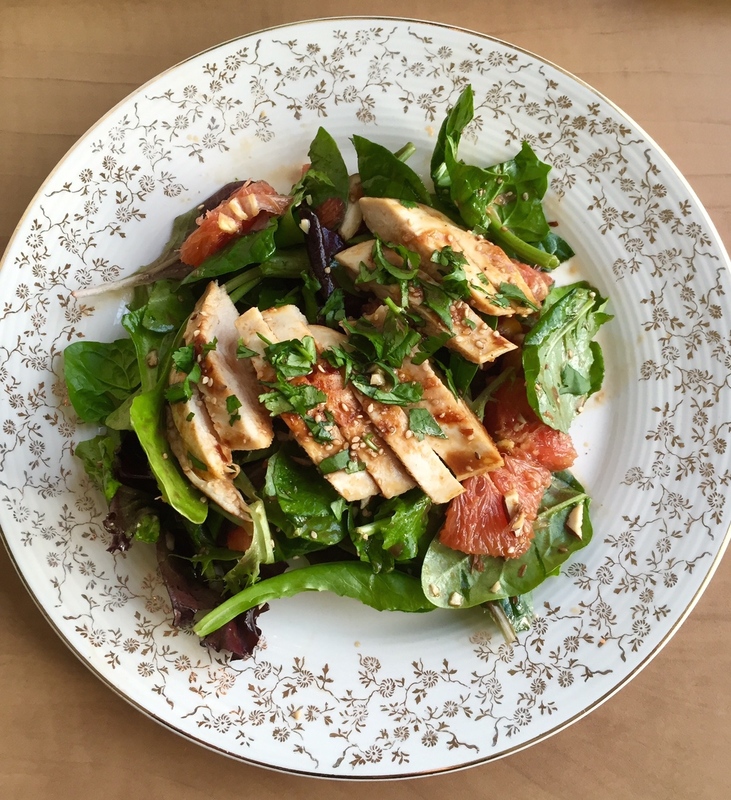 Put chicken on top of the salad, drizzle on the extra dressing and top with cilantro. Enjoy!